In late 2013 I went to my first AWS re:Invent conference to quickly learn as much about AWS as possible so I could provide support for a very high profile Lay's project that ultimately went on to reach the home page of Reddit. At that point all I knew about cloud computing was running virtual machines in the cloud. Or as some put it, the cloud is just someone else's computer. When I returned after the conference, which was much smaller back then and could fit in one hotel/casino, I brought back a ton of new information to help re-architect the website we were building. I suddenly knew all these new terms like EC2, RDS, S3, read replica, CloudFront, Cloudwatch, highly-available, availability zones, regions etc.. I've attended re:Invent almost every year since save for 2015. It's my favorite conference. I always learn something new and interesting and it doesn't hurt that it takes place in Las Vegas during football season. 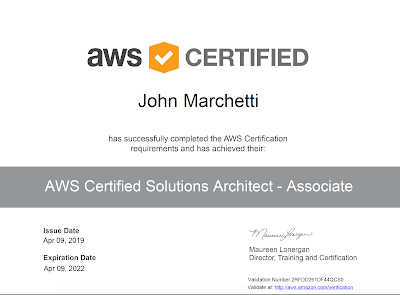 So finally after all this time I wanted to pass one of the AWS exams. 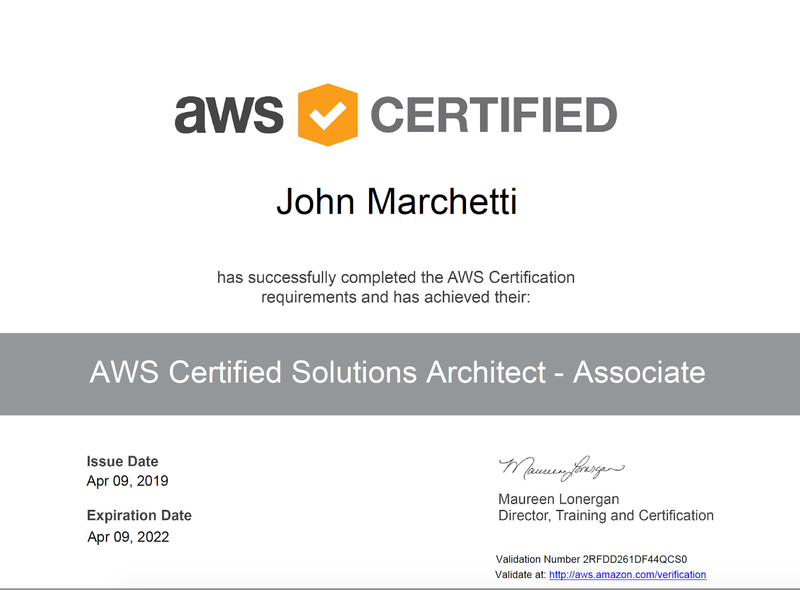 I chose the Solutions Architect exam first as many do. I purchased the Solutions Architect Associate and Developer Associate from Udemy for around $25.00. While watching Ryan's videos I realized something I had forgotten along the way: I learn way better when watching/listening to someone than I do when reading. So these videos were great. Now, the courses assume you know nothing about AWS but I'll be honest. If you come into this completely cold, you'll get lost in a sea of service names and there are a ton. S3, EBS, EC2, RDS, DynamoDB, Elasticahe, Glue, IAM, VPC etc.. it goes on and on. So having a background in AWS will greatly help you out but it's not required to take Ryan's course. I watched his VPC section about 10 times and made sure I could build a VPC prior to taking the exam. It comes up a lot on the exam. Closet to 10 questions at least. After watching the A Cloud Guru course I sat for another practice exam. They're $20 each by the way and scored a 90%. At this point I scheduled my exam one week away with the confidence that I was ready. I then decided to hit up Reddit and A Cloud Guru forums to see what recent test takers were saying. That's when I learned of things like MQ, MariaDB, Athena, DAX and I thought "what the hell are those?" AWS changes all the time. They release a new service every day it seems. And I had noi idea what any of those were and none of those showed up on my practice test. I then learned of Jon Bonso and his practice exams. These are available for about $20 on Udemy and they include 7 practice tests which are the full 65 questions (which is what the real exam consists of) and will take you at least one hour to complete at minimum. Great, in depth explanations for why an answer is right and why the other options are wrong. This is so helpful and just going over this the day before my exam was good for 3 or 4 marks on the real exam. I didn't really review anything the day of. I only briefly looked up a few AWS services which I kept forgetting such as Glue, Inspector and OpsWorks. I didn't review any questions. I arrived quite early to take the exam so I wasn't rushing either. I'm a nervous test taker so the minute the exam begins and the countdown starts I get the butterflies going. I read the first question two or three times and it was a rather easy question but I was drawing blanks for some reason. I finally settled in and completed the exam in about 90 minutes. I did my best to be thorough with the questions, reading them multiple times and really looking for the key words which would make one answer more correct. Things such as "dynamic content" or "most cost effective" are key. Dynamic content will usually rule out Cloudfront. Real-time data will rule out elasticache and so on. The test is hard but it's not outrageously difficult. If you have a few years of AWS experience working with S3 and EC2 and RDS and know VPCs inside and out you'll be completely fine.